For years, fun-seekers have been patronising the Grand and Grill Bar along the M1 Road in Chirimba, Blantyre. But on Monday night the situation turned out different as the usual fun that people have was disrupted when a fire, which is alleged to have started from the main switch, broke out few minutes after 11pm. It was a desperate and sad moment for both the owners and the patrons as the intensity of the fire prevented any effort to rescue valuables. During our visit to the place on Tuesday morning, people were seen pouring water in some spots which still had embers of fire and smoke. 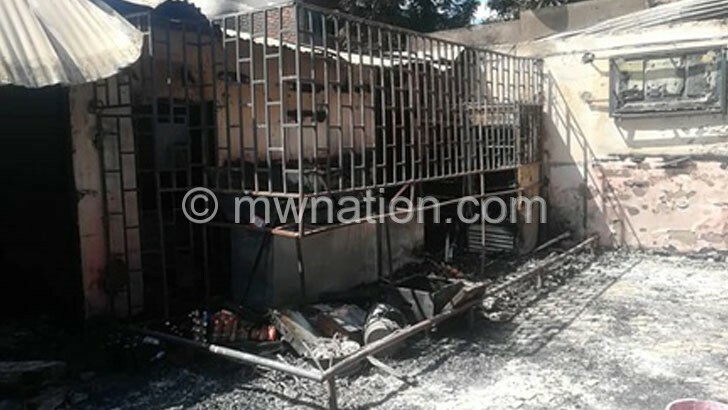 According to the bar’s customer care manager Andrew Mbalati, Blantyre City Council firefighting team arrived at the scene an hour and a half later when the fire had caught almost the whole building. “It is an electrical fault that we believe resulted from the wires that brings all the electricity into the bar. Fortunately, there were no fatalities or serious injuries expect for one person who got injured as he was trying to escape,” he said. Mbalati said it is too early to assess how much has been lost because of the fire. He has indicated they have already reported the matter to Electricity Supply Corporation of Malawi (Escom). When contacted, Escom public relations manager Innocent Chitosi said they heard about the accident and that their team is currently on the ground to investigate the matter. “The cause of this unfortunate accident can only be established after a thorough and professional investigation as has always been the case in such occurrences,” he said.